Sixteen year old Aine lives in the Colony, and his whole life was decided before he was born. In two years he will marry the girl next door, Brin, who was assigned as his Other at birth. Then he will be assigned to a position in the Colony's workforce that best suits his talents. 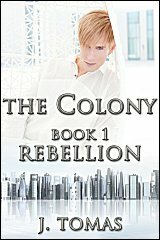 Each night he takes four pills, like everyone else in the Colony, and he knows the pills keep them safe and their world in order. Terrified, he tries to hide the mistake, but when he dreams for the first time in his life, he discovers all he's been missing. What scares him more than not taking the pill, though, is how alive his dreams make him feel. Because it isn't Brin he dreams of but his best friend Kyer. Suddenly Aine's world turns upside down, and he doesn't know what to think or who to trust. All he knows for sure is he's falling in love with Kyer, which is forbidden by the Colony's Code, and he will do anything to protect their budding relationship. 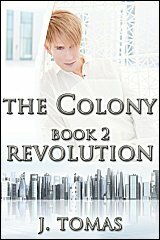 Add your reviews of The Colony, Book 1 and/or 2 in comments! These look great, I'm a fan of J. Tomas! Never seen "Aine" as a boy's name before, that's different and futuristic.